For slow-moving monsters, you can move past them by sliding your finger through gaps at a normal pace. But you will have to quickly drag your finger upwards to avoid getting your finger snipped by fast-moving critters. Change your speed and direction according to the speed and movement pattern of those monsters. When you spot a monster, try to squeeze past it quickly by sliding your finger upwards and then drag your finger downwards before the next monster appears on the screen. Once you find a gap between obstacles, quickly guide your finger through it and then move back so that you can get a breather for second until the next monster appears on the screen. Keeping your finger on the bottom of the screen, sliding your finger through a gap quickly and then retreating again before making the next move is a good way to stay alive in the game for a long time. Remember that the monsters are after your finger and not the trail that moves behind it. If you have unlocked one, then you will notice that dragging your finger upwards leaves an animated trail, such as a trail of musical notes. There are different types of trails, such as rainbow trails, multi-color trails etc. There’s no need to worry about your finger’s trail as monsters are only interested in chomping your finger. 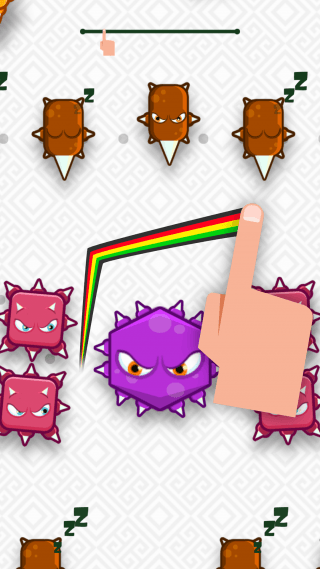 Focus on your finger and make sure you don’t hit a monster’s teeth while moving past gaps. You can use your thumb or index finger to play Mmm Fingers 2, but just make sure you are comfortable with it. I like using my little finger to move past obstacles while holding the phone with my left hand. If you have fat fingers then you might have problem to squeeze between smaller gaps between moving monsters. In such situations, you can either use your little finger or a thin stylus. Just don’t lift your finger or the stylus or else its game over. It takes a lot of practice to excel in any skill game. In this game, you will need some good practice to reach a high score. Keep playing and follow the above tips to score more points. If you are playing this game for the first time, then observe and memorize the movement and behavior pattern of each monster. When you start a new game, the same monsters will appear randomly, but since you would now know how they behave and how fast they move, it would be easier for you to squeeze past them. Expect plenty of surprises and new monsters as you break your previous score record. Mmm Fingers 2 has introduced a new multiplayer mode called “Daily Challenge”. It lets you play against other players around the world to score more and rank higher on the online leaderboard. Tap the calendar icon on the home screen to access this new game mode. Every player will face the same monsters, so the competition is evenly poised, but then each day, there a new challenge waiting for players, so make sure you practice dodging monsters in the main game before trying the Daily Challenge. To replay a daily challenge, you can spend gems or watch a 30-sec video. Challenges are divided into three modes: Easy, Hard and Speed. In every challenge, you will have to guide your finger to the finishing line by dodging traps and moving past critters. Start with Easy mode and once you unlock all challenges in Easy, start with the next difficulty mode. Practice these simple challenges before playing the multiplayer challenge game. You may have observed horizontal lines while playing. Well, these are nothing but milestones, and going past them will let you beat your previous score or get past the average score. Keep an eye on such lines, but don’t lose your focus. Guns Royale – Tips and Strategies to Stay Alive and Survive!